Dartmouth hosted the Ivy League Heptagonal Indoor Championships this past weekend at Leverone Field House. Heps brought together all eight Ivy League schools to compete for the conference title. 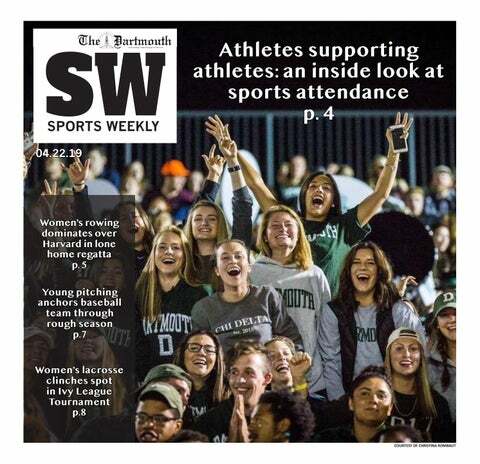 Dartmouth gets the chance to host the championship every four years,. The men’s team ended up in fourth place after a Sunday push thanks to Justin Donawa ’19, who placed first in the triple jump. Dartmouth won the heptathlon event for the 12th time in school history, this time by Ben Ose ’19 with 5,430 points. Ben Colello ’18 was third with 5,202 points and Matthew Sindelar ’18 was fourth with 4,927 points. Among heptathletes, Colello finished first in the 60-meter hurdles and shot put and Sindelar finished first in the high jump. The women’s team finished in third place thanks to strong individual performances. Cha’Mia Rothwell ’20 earned two first-team All-Ivy League honors in the long jump and the 60-meter hurdles. She also took second place in the 200-meter dash, earning 28 total points for the Big Green, the most of any student-athlete. Rothwell was named Female Field Performer of the Meet. Other notable performances included Julia Valenti ’20’s first-place finish in the pole vault. Maria Garman ’19 and Camille Landon ’21 picked up 14 points for the Big Green in the high jump, taking second and third, respectively. Zachary Plante ’18 who ran the 400-meter prelims on Saturday and the 400 leg of the distance medley relay on Sunday found hosting Heps extremely special. “There’s something magical about Heps no matter where it is, but to have it here, with parents and friends, and to be in Leverone, where I’ve considered home for the past three years, there’s something even more magical about having it here,” Plante said. Rothwell, who got first place in the 60m hurdles and the long jump both last year and this year, broke her school record and set a new New England record on Saturday in the 60m hurdles. She bested former Olympian and Boston University athlete Sharon Colyear’s 1981 time of 8.21 seconds by running the event in 8.20 seconds. In the long jump, she bested her 2017 jump of 6.17 meters by jumping 6.27 meters, a new school record. According to Rothwell, her long jump results earlier in the season were disapointing. “I kept doing my own thing and trusting [jumps coach Tim Wunderlich ’09], and it came on at the right time so what better way to end the indoor season in long jump than a school record and a personal best,” she added. Men’s track and field co-captain Amos Cariati ’18 noted that he was less nervous than years past due to the fact that, as one of three captains he dealt with lots of logistical details that kept his mind off the competition, which he was grateful for. He ran in the 400-meter prelimiaries on Saturday and finished second by .07 seconds. He didn’t move on to finals on Sunday but was the anchor for the 4x400-meter relay. “Bringing it home with the alumni back and the whole building erupting was an incredible moment,” Cariati said. Cariati noted how beneficial competing at home was for the team. “The home track advantage is always nice since we know when to cut and how to position ourselves better, but the real benefit of having it at home was all the support,” Cariati said. He was surprised and thankful to see all the support the team got. “Even [College President Phil] Hanlon was there,” Cariati said. Wunderlich said that since the meet was home this year, expectations were high. However, everyone outperformed what was predicted. “We were extremely happy with the result and look forward to the outdoor season,” Wunderlich said.